Alongside a quiet country road on a prominent ridge overlooking the amazingly beautiful green valley of the River Dee stands this magnificent 15th Century square four-storey tower house. 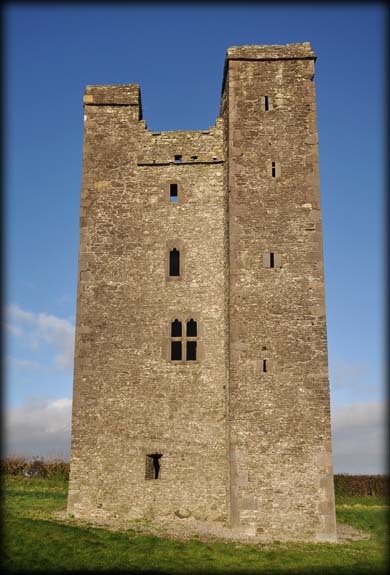 Although roofless, it is a well preserved example of a fortified tower house which was once the most common residence of the rural gentry in late Medieval Ireland (AD c. 1400 to 1600). As is typical for this type of castle, it contained a vaulted ground-floor cellar or storage space, a murder-hole inside the main entrance enabling the defenders to drop things on the heads of intruders, a crenellated parapet, garderobes in one of the two projecting turrets and a spiral stairway to each level including the roof in the second turret, gabled roof and wall-walk. The door is at ground level on the eastern side. The windows in the first and second floors have nicely carved 15th-century cusped ogee-headed lights, all with glazing bar holes. Two double-ogee windows grace the first-floor hall, one window with a transom bar. These upper floors with their larger windows, fireplaces, and sometimes separate bed-chambers were living quarters. Unfortunately, neither the names of the builders nor occupants of this fine house has been recorded. The views to the south from this residence must have been magnificent. No evidence of a Bawn remains. The castle was locked during our visit. 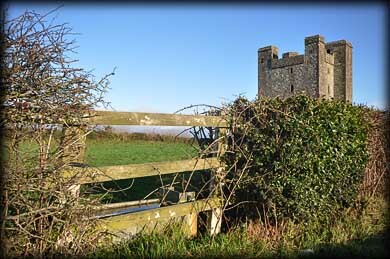 Situated: From Ardee head north on the N2. At roundabout take the N52. Go through next roundabout. Take next right, signposted Stabannan. Castle is about 3 kilometres along this road on the left. Discovery Map 36: N 9953 9249. Last visit Jan 2012.